Vinyl flooring and luxury vinyl tiles are well-suited for use with electric floor heating. The most suitable underfloor heating system to use with vinyl flooring is dependent on which kind of vinyl flooring you are using and whether the room you are installing the new system in is a ‘Wet’ or ‘Dry’ room: bathrooms typically being considered Wet and living rooms, bedrooms, kitchens being Dry. There are four types of vinyl flooring that differ in their properties and therefore in their specification requirements for an underfloor heating system. These types are Amtico, Karndean, Click Vinyl and Tarkett floor. Always check with the floor manufacturer for the chosen type of vinyl’s compatibility with underfloor heating. A dry room is a room without a significant water element in it. Rooms like bedrooms, living rooms, hallways are so-called dry rooms, as well as kitchens, even though they feature sinks and often washing machines / dishwashers. The Foil Heater electric underfloor heating system used with Warmup’s Dual Overlay subfloor, which separates the system from the floor finish, is suitable with most vinyl floor finishes in dry rooms. Ideal for large areas, the Foil Heater is an electric floor heating system used with Dual Overlay for most of the vinyl floors in dry areas. Dual Overlay is a free-floating subfloor for use with the Foil Heater under carpet, vinyl and linoleum floor finishes. This system is not suitable for wet rooms as the Dual Overlay may expand due to excessive moisture. It is important that you check with the vinyl flooring manufacturer on the types of underfloor heating systems that are suitable to use with their products. 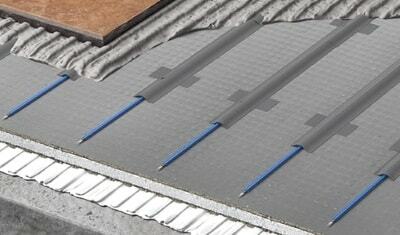 Some floor manufactures only allow the use of underfloor heating systems embedded within a screed/ levelling compound. Underfloor heating can be installed in wet rooms with vinyl floors. Depending on your project specification we recommend the DCM-PRO, StickyMat or Loose Wire Systems. Remember to always cover the underfloor heating system with a 10mm deep layer of self-levelling compound to protect the system from moisture before the vinyl flooring is laid down. The SPM heating mat features an ultra-thin 1,8 mm wire that does not raise the floor levels. DCM-PRO is a heated decoupling system designed for fast installation in all areas. The DWS heating cable is perfect for designed irregularly shaped rooms. The WIS heating cable is designed for use in new building. The temperature of your underfloor heating system should not exceed 27°C with vinyl floors. This is safeguarded by using a thermostat and indicating in the setup that the system is being used with vinyl flooring. The Warmup range of thermostats for underfloor heating has controllers for every need. The 4iE Smart WiFi Thermostat possesses incredibly smart features that ensure you enjoy your heated floor space safely and efficiently. The thermostat gives you total control of your heating settings and allows you to enjoy a warm room when desired with no wasted energy. The temperature of your underfloor heating system should not exceed 27°C with vinyl floors. This is safeguarded by using a thermostat and indicating in the setup that the system is being used with vinyl flooring. The Warmup range of thermostats for underfloor heating has controllers for every need. The 4iE Smart WiFi Thermostat possesses incredibly smart features that ensure you enjoy your heated floor space safely and efficiently. The thermostat gives you total control of your heating settings and allows you to enjoy a warm room when desired with no wasted energy. Everything above the heater, including underlay, overlay, and final floor finish need to be in the limits set in the table below. If the manufacturer of the vinyl flooring states that it must be used in conjunction with an underlay, the underlay must be no more than 3mm – 6mm thick and breathable. When using the system with vinyl flooring, care should be taken to ensure effective performance of the system and we do not recommend installing the system if the limits below are not met. This may hinder the performance of the system and result in the system not working as desired. The figures below are for electric underfloor heating systems only. Water systems have a broader range of limits due to the variables of the specification.